I was really looking forward to this week’s recipe. Over the years I’ve had my share of bakery-made (or, horrors, store-bought) rugelach, and I was looking forward to seeing what they taste like fresh from the oven. Dorie recommends raspberry or apricot preserves; I doubled the batch to have enough for a potluck lunch on Sunday, and I planned to make half apple and half raspberry. As it turned out, the apple jelly I liquefied for the first half was enough for both, so they’re all apple. But while I was melting the jelly, it hit me: cherry. That was the way to go. Cherry jelly would have been insanely good. Anyway, apple it was. Needless to say, I left out the currants. The dough was easy to make and easy to work with. I hate rolling out dough almost as much as I hate fruit in my desserts, so I was worried about that part. But I used the plastic wrap the dough was refrigerated in as a shield between the rolling pin and the dough, and everything worked perfectly. I couldn’t get the dough into a perfect circle, of course, because I never can, but because the circle wound up being cut into 16 wedges, it didn’t matter. Assembly was easy. Cutting was easy. Rolling up the cute little rugelach (rugelachen?) was easy. Even knowing when they were done was easy; I often have trouble with that part. Really, the worst part of the whole endeavor was the waiting time; the dough has to be refrigerated for at least two hours before it’s rolled out, and the cookies have to be refrigerated for at least 30 minutes before you bake them. But even that wouldn’t matter if I’d spread the process out over a few days, as Dorie says works just fine. I took them to a potluck Sunday afternoon, and they went like hotcakes, as they say. Everyone raved about them, and they still were light-years better than the bakery ones — extremely moist and flavorful. But they’d lost that lovely crackliness, which was my favorite thing about them. If you want to try them yourself, head on over to Piggy’s Cooking Journal, where the recipe will be posted (and where you can check out her amazing food photographs). And if you want to see what the other TWD bloggers did with the recipe (and I’m sure there will be some great variations), work your way through the recently expanded blogroll at Tuesdays With Dorie. This entry was posted Tuesday, November 4th, 2008 at 8:00 am	and is filed under baking, Dorie, food. You can leave a response, or trackback from your own site. Hehe – rugelachen. Love it. And apple jelly sounds delicious, although I agree that cherry would have been amazing too. OH! yes… it looks like an inviting bed of… rugelach! How tempting! Beautiful! 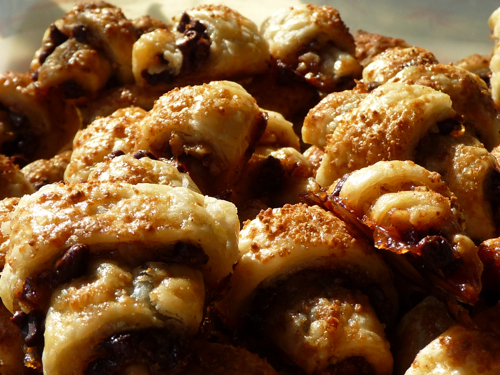 Your rugelach and photos look divine! Love these! Thanks for stopping by my blog. I love your photo…nice job. I agree, I would love to try cherry jelly, I think those would be fantastic. I plan to make these again for our Christmas potluck too, they’re so easy. Those look absolutely beautiful and I love the photos! I think Cherry really would be a nice flavor for these. Next time! ooh yours look so perfect!! beautiful job. glad you enjoyed them. cherry would be delicious! Yours look like the ones I used to get from my favorite bakery. YUMMY! Yours looks so great! And oh, cherry really would be amazing! Your rugelach(en) look wonderful. I agree that they lost a little something after being stored for a couple days, but definitely a recipe worth holding on to. Lillian, thanks for visiting! Weren’t these good? I love the idea of apple jelly in a rugelach (I can never find it, though!) And your photos are wonderful…I want to dive right into them! Fabulous pictures! They look amazing. Yum, so pretty! I agree that cherry would have been divine – I also left out the dried fruit (as I usually do). Good job getting your dough into 16 wedges – I couldn’t get my circle to 11 or 12 inches, so I ended up only cutting mine into 8 wedges. Yes, cherry jam next time! Okay, that settles it…all chocolate desserts come your way and all fruit desserts come my way, okay????? LOL. You left out the raisins and not the chocolate???? Just kidding. Your cookies look amazing and it was fun reading your post. I’ll be back next week…especially with all those lovely strawberries on your header…I am originally from Strawberry Point, Iowa, so there’s a certain affinity there for the berry…enjoy the day! 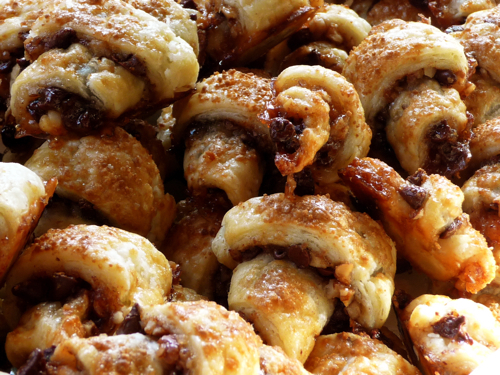 Your rugelach looks delish in all your pictures! So glad to hear that you and the other pot luck-ers enjoyed the recipe! My I please trade mine for yours? You did a fantastic job. The photos look delicious. Great looking rugelach! And cherry jelly sounds yummie. Thank you for visiting my blig. Thanks for stopping by my blog and welcoming me to TWD. Your rugelach look great! They look wonderful and abundant all piled up like that. I can see why everyone loved them. These pictures are amazing! Your rugelach are positively GLOWING. Gorgeous. Ciao ! Thanks for the visit ! I love your rugelachen and your pictures ! I should write at least a post about Roman jewish cookery you are right ! Mmm, yours look so yummy! I too found the process a bit overwhelming for one day. Next time, I’ll definitely make the dough ahead of time.